Jax Hat is my favorite ultimate tournament! It's a hat style tournament, which means you don't go as a team, but as a individual, and get placed on teams. It's a great way to meet new people and catch up with all the friends you've made along the way! I've been to 6 of the 7 years Jax Hat has been held and I've loved every one of them! I try not to gush about ultimate all the time and bore you to death of the subject, but I'm very grateful for all the many years I've played, all the experiences I've had, and all the people I've met (especially Kevin!!!). I'm not all that athletic so I can't even pinpoint how it started, but I used to be down-right awful at it and I kept going back... it was an obsession and it pretty much still is! 2008 - Kevin's team won!!! 2011 group shot with the blue team - my team (purple) got second! my feet actually left the ground!!! that never happens (cause this white girl can't jump)!!! 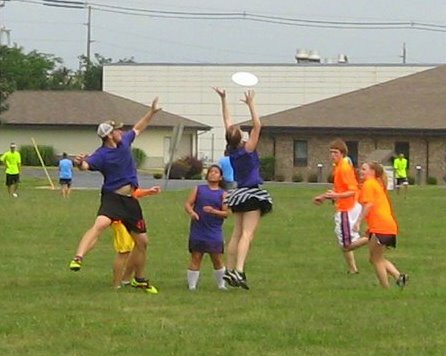 yes, I am wearing a skirt (whith shorts underneath) it's an old ultimate tradition, but since i'm kinda old now I try to maintain the tradition at fun tournaments like Jax Hat and Mel is wearing one too! Kevin's team had bright orange shirts - no saturation required!